―　After winning Grand Prize, how do you feel? I’m very proud and happy. I didn’t expect or imagine such great response. I’m very happy and proud to be here. 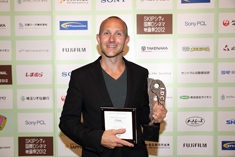 It’s a big honor to have been invited to the festival and win Grand Prize. It’s great publicity for the film too. I hope it helps the film to get released in Japan. We are very pleased. ―　What are your impressions of the festival? It’s very familiar, polite and everyone at the festival has been very nice. I have felt like family here and everyone knows each other. I have experienced great emotional connection and camaraderie. The festival is cute and cool while also being very well organized. I’ve never attended a festival that was so warm and intimate while maintaining good structure and organization. 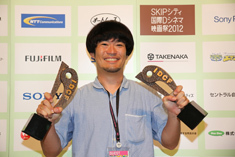 <Best Director and SKIP CITY AWARD> Ryota Nakano(Director) "Capturing Dad"
―　You won Best Director and a SKIP CITY AWARD(production support for the winner’s next project), what are your ambitions after this? I received the Best Director, but the quality of the other films screened in the competition was very high and made me realize there’s still work that needs to be done on my film. I would like to improve my skills with each film I direct. I would like to keep working to produce better content for my next film which will receive support from this SKIP CITY AWARD. <Best Screenplay> Tijs van Marle(Screenplay) "Bon Voyage"
It is a very nice festival and the films they selected are very professional. We are having a fantastic time here at the festival. Everybody has been very nice. As I said, the qualities of the films are very high. 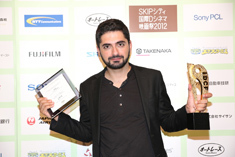 I was very surprised to win the prize because there are many good films are here. 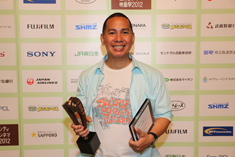 <Special Jury Prize> Rommel Tolentino(Director) "Nono"
It’s a very nice and friendly film festival. Of all the festivals I’ve been, this is one of the best planned. And the staffs are really nice and they took good care of us. It’s such a breath of fresh air. Because other festivals are kind of complicated but this one is very simple and laid back, I really have enjoyed it. 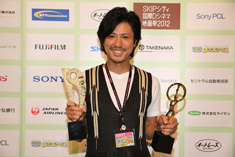 <Best Picture>Hiroaki Kakukawa(Director) "Dream Notebook"
―　What are your ambitions after this? I launched an organization called Musical of Japan and I want to promote musical cinemas in Japan as in a form that Japanese people would like. The screenings of my film in this festival has been a wonderful opportunity for me. I would like to seize this opportunity to develop further. 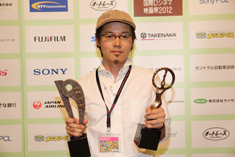 <Honorable Mention> Kotaro Wajima(Director) "With Little Yuri Episode1. Sunset 30min"
I talked about this among other directors that this film festival has been amazing. The screening environment was fantastic and the films came out beautifully. The audience watched films really carefully and had good questions in the Q&A. I really appreciate this opportunity to have been taken part in the festival. 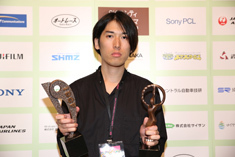 <Honorable Mention> Shohei Tada(Director) "Trubow"
I felt that this film festival is built with the support from people in this region and Saitama prefecture. There was enough time for the Q&A session with the audience and they sympathized with the feelings of the filmmakers. I was impressed by the sense of unity with the audience at the festival.